Let me start by saying that I pretty much use GURPS as a drop-in replacement for Classic Traveller’s “Book 1: Characters and Combat.” Character points are, to me, just a way to avoid the weirdness of classes, levels, and multi-classing from AD&D. “I want a heroic level character that has about 20% thief abilities, 50% mutant superpowers, and 30% sunk into fighter abilities.” Got it. With a prep time of about two hours per character and six hours per session, I can run just about anything without really cracking a book once they players get to the table. In short, GURPS works as advertised and what it does do, it does well. From this standpoint, GURPS is extremely well engineered. If you are designing your own setting or your own take on a setting, the Genre books (like the Aliens issue of Pyramid) provide you with a lot of information to help you set things up. Of course, to a certain extent, a generic system almost makes Genre irrelevant, but that’s a different story. The combat system makes sense and the modifications and optional rules can be added piecemeal without a lot of headache. I routinely use stuff from High Tech and Martial Arts without really understanding those works in total. At its best, the GURPS line functions as a sort of encyclopedia of role-playingness that you can use bits and pieces from at your own leisure. But then there is the place where GURPS doesn’t work. It all started with GDW’s Striker way back in 1981. This was a miniatures ruleset with an extensive vehicle design system– it could make tanks for World War I all the way up to Traveller TL 15. It came with no scenario book, no vehicle design book, and no evidence that people could or would actually play the game. This system evolved over time into Traveller The New Era’s Fusion, Fire, and Steel, an end all be all design system for any genre of science fiction. You’d design not only the guns as you did in Striker, but you could actually design the bullets, too. GURPS evidently had to have an unplayable monster game, too, so back in the nineties, GURPS Vehicles was born. Maybe it’s just that I’m the sort of person that likes the old school micro-games that CAR WARS and Star Fleet Battles grew out of. Maybe it’s just that at some point, a block war game or euro-style economic game is a better model of what’s actually happening. Maybe I can never forgive what was done to GURPS Autoduel when it was revamped to use GURPS Vehicles. Maybe I’ll just be forever scarred over not actually being able to run a game with GURPS Far Trader; maybe I’m just disappointed that nobody actually uses GURPS Starships for playing space battles. But I just can’t stand stupid extraneous detail that doesn’t even make a game– that can’t conceivably be used in the context of even the nerdiest role playing session. This sort of thing just makes me furious! Argh! Frankly, I’m just not the target audience for this issue of Pyramid. The reuse of the old school artwork really draws me in, but the contents… well… they’re something else. 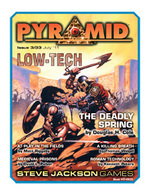 The Deadly Spring: This will probably be the most infamous Pyramid article of all time. Good grief! You choose the materials and specifications… plug in to a variety of equations… and maybe you’ll have a bow at the end. I majored in math and I don’t understand half this stuff. (Physics departments produce an entirely different strain of nerdiness, I suppose.) This article makes the unplayable Striker look like a chump’s game. It includes some sample bows, but… for me… a generic bow is sufficient for most of what I want to do. At Play in the Fields: The material for this article got cut from one of the Low Tech supplements and looks like it is dependent on it, so it is not quite usable on its own. This article gives you the information you need to determine how much cash crop your farmers can produced given the acreage, labor, crop rotation, and seasonal adjustments. I really appreciate how the GURPS line is pretty much an encyclopedia of sorts, but this article takes that to an absurd extreme. Who plays a game like this…? Medieval Prisons: This is a short overview of what prisons are actually like. As with the above articles, this is so dense and academic I can barely read it. I’m afraid that historically inaccurate stereotypes are entirely sufficient for the type of games I’m liable to run. A Killing Breath: Okay, this is something that I can use! This is complete to the point of silliness, but it is usuable as-is. Weapon stats, High-Tech style modifications and variations, new perks and martial arts styles…. This article was put together by someone that is fluent in the entire GURPS line. My favorite bit is the -4 penalty for hearing where the attack is coming from. Stealth and guile for the win! Now where are the poison rules…. Roman Technology: Another dry, academic article… but… as much as I hate to admit it, this is exactly the sort of stuff you’d want to know if you were going to run a campaign set in this period. It covers broad, game-impacting things that you probably wouldn’t know about. You get stats for the vehicles of the era. Common misconceptions are cleared up. Hooks for cool adventure settings and patrons are buried in here… and… if you ran with them, you’d have something that fit the setting in a significant, and flavorful way. An article like this is something that I’d really like to have for various Traveller worlds– I often rack my brains to come up with this type of thing before giving up or switching to fast-and-loose space opera. (Niven and Pournelle probably come up with these details reflexively.) As a bonus, this article has a direct application to the Roma Arcana setting in GURPS Fantasy and the Roma Universalis setting covered in Pyramid 3/20, 3/24, 3/27, and 3/30. Low Tech, High Fun: The editor seems to realize that some sort of line has been crossed here with the Low Tech series. He attempts to make the case for how it can improve your sessions while drawing on actual gaming experiences to make the point. The biggest problem with the Low Tech series is that GURPS Basic Set is already so good. Compared to that second edition box set from the eighties, it is epically complete. It addresses almost every game design, realism, and playability issue I’ve ever thought of. In practice, most players don’t really care about the rules– they care about the adventure. In my experience, they really don’t get much beyond the “rolling low is good” stage in terms of what they internalize. So while High Tech is an invaluable reference for me, I just don’t think I’m missing out by not having every single cotton picking Low Tech supplement. On the other hand… as much as I went into this issue with a chip on my shoulder, the article on Roman Technology really got my attention. As someone that’s struggled to make randomly generated Traveller worlds come alive, I have to admit that this sort of information is invaluable. If Low Tech is anything like that, then there probably is room for it in my gaming library. Finally… as I work my way backwards through the most recent issues of Pyramid, I have to point out that issues 33 to 35 are even more useful together than they are individually. With very little effort, I have a new low tech alien race in mind that will use the small creatures alternate rules from issue 34 and the blowgun rules in this one. (Maybe I can use that starting conditions article to give them an unusual motivation….) Even though these issues are designed as stand-alone supplements to expand existing genre lines, it appears to me that a subscription to Pyramid would be well worth the cash even if there was an occasional issue that was maybe only half-good or half-usable like this one was for me. It all works together… and it all works…! Fair point on the useability of The Deadly Spring as a written article. Did you, by chance, play with the included spreadsheet at all? Each worked example has its own file, as well as a generic one that allows you to start from scratch. Pity you didn’t get that far, ’cause it actually gets worse. After you use the spreadsheet and choose all the materials and engineering factors and arrive at a completed bow design, you find that… it doesn’t really even make much difference. Because the range of damage is more realistically capped, the damage inflicted by the very best bow isn’t really vastly more than that done by the most primitive one. Range varies a little more, but most RPG combat tends to occur at “back alley” ranges anyway. I actually find the article an impressive technical achievement, and I wouldn’t have been at all opposed to using the system to make a range of common bows for a campaign, and perhaps a couple extra-special custom ones for specialist players or cool treasures, but all the article really does in the end is exhaustively document how overpowered bows are standard GURPS. Okay. Point taken.